Middle school performers are often reluctant to jump up in front of their peers and start performing. That’s why having the perfect material for them is a must! Rebecca Young knows how middle schoolers think and act — and what they like to talk about! This book was written specifically for middle school performers — about topics they can relate to in a language style they understand. A wide variety of topics to fit any student’s personality allows young actors to choose from either humorous or dramatic selections. The duologues and triologues should not be confused with scenes for two or three actors. Read more...Instead, they consist of a pair or trio of monologues on the same topic, but from different perspectives! These monologues, duologues, and triologues may be used for auditions, classroom assignments, or discussion starters. Many of the monologues are adaptable for guys or girls, making this book even more valuable as a resource! In her seventh drama book for teens, Rebecca Young demonstrates her wonderful ability to write in the voice of teenage characters and emphasize believable experiences that appeal to young actors. Boyfriend issues, girlfriend issues. Teacher issues, parent issues. Sports issues, band issues. Love, hate, jealousy, betrayal, and so much more. Middle school years are some of the best and hardest times a student can go through, and Young captures both the drama and especially the humor of this unique age. The book is fairly even divided between monologues for girls, for guys, or for either, and the wide variety of topics ensures a good fit with any student’s personality. All monologues are between one and two minutes and are suitable for auditions, classroom performance, speech competitions, or acting practice. 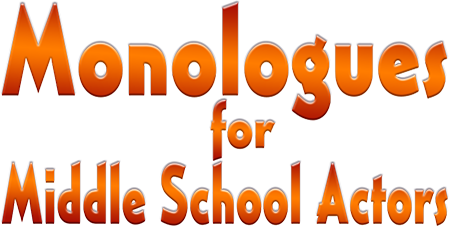 Another great collection of monologues in the style of 102 Monologues for Middle School Actors by the same author. She knows how middle schoolers think and act, and she portrays their character traits in performance. With such a wide variety of topics, there is a monologue to fit any student’s personality or preference. 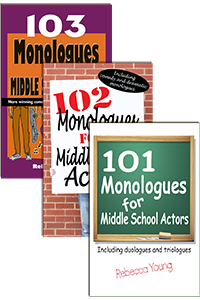 These monologues may be used for auditions, class assignments, drama workshops, or discussion starters. The characters speak as middle schoolers live. Sample titles include: Princess Pampering, Detention for This?, My Teenage Father, The End of the World Is Not Coming, My Own Kind of Makeup, Slumber Party Terror, Rollerblading Rocks, Banned from TV, Wish Obsessed, Gurgling Gut,and 93 more!